Fulkopi Alu'r Dalna to enjoy the simple pleasures of life. Few years back I dint know what thanks giving day is all about and frankly speaking I dint care. As a young girl I was not aware what real responsibilities mean. I loved my family, took care of them, did whatever work they gave me but somewhere in my mind I knew I am taken care of. I knew whether I do it or not works would be done to make our life smooth and running. But today it’s a different story. Yes every now and then I complain for being stuck in the household chores and how the hubby is getting all the fun by going to work. I get angry on my little one for scattering his toys and creating a mess. I argue with my father for little little things and throw a feat every time Maa says something critical. Forget about the way I argue like a mad woman when traffic is stuck in the road or the summer heat is unbearable. A bunch of water Hyacinth flowers, collected on our way back from the property in the suburbs. Its a spectacular scene when they bloom together all over the water bodies. But at the end of the day when I come to bed to my family, that little soft bundle smelling of milk and innocence gives me comfort. I feel blessed to have him in my life, for having this luxury and stay at home to watch him grow, to hold him tight anytime I feel like. So every night I count my blessings and Thank God for everything. For having this opportunity of being treated as equal with my brothers, to have such loving parents and siblings providing me a cushion to fall back upon, to have such a wonderful husband like ‘A’ who listens to my every whim and unconditionally supports and believes in me, to have wonderful friends and family who appreciate every little things I do for them, to have a beautiful son in ‘R’ who never never forgets to tell me ‘tumi khub bhalo Mummum (you are a very good mother)’, to have a family to come back to, to have enough food to cook and feed them, to do things that I enjoy and mostly to be myself. 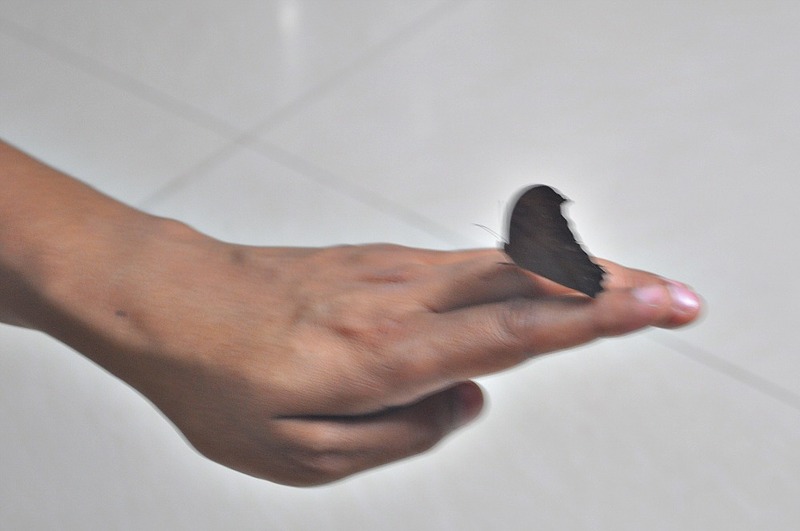 A visitor who came to say Hi!!! But life is not fair everywhere and sometimes without any reason. This relisation have made me more optimistic. I have learnt to thank, to appreciate and to be grateful. The glass is always half full for me and nothing is taken for granted anymore. So today when I feel gratified I also pray to God to bring good health, peace and happiness to everyone. While I write this lets look around ourselves and enjoy the simple pleasures of life. It's the little moments that make life big. 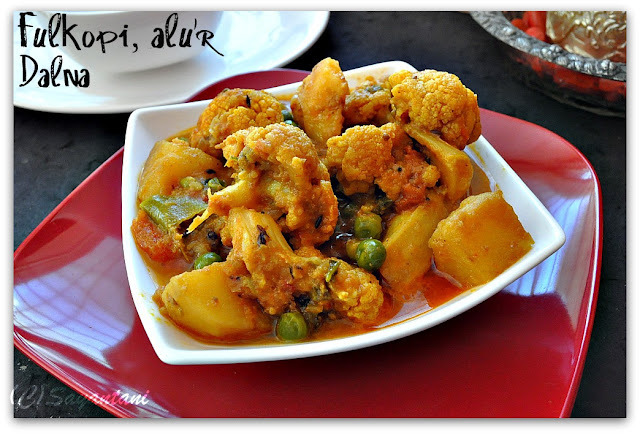 Fulkopi’r torkari is a light flavourful curry made with cauliflower, potatoes and green peas. This dish is also a simple everyday dish, but what makes it special is the fresh seasonal produce. I waited for my mom’s vegetable garden to deliver the first homegrown cauliflower of the season to cook this dish. The cauliflowers she grew are small and not perfect. But the fact that they are Tended and cared for with love brings joy to the table. Its not only food that nourishes our body but also something that soothes our soul. Boiling cauliflowers in hot salted water for a few minutes is very important as it helps to get rid of the dirt and small insects stuck inside. Cut the cauliflower in small florets. Wash under running water and then boil or microwave for 4-5 minutes in salted water. Drain and mix with little salt and turmeric. Keep aside. While the cauliflower is boiling, peel and cut potato in medium cubes. Cut the tomato in small pieces and sprinkle little salt over it. Keep aside. In a small bowl mix ginger paste, cumin, coriander, turmeric and chili powder with ¼ cup water. Once the cauliflower is boiled heat 2 tbsp oil in a pan. Add the cauliflowers pieces and fry on medium till golden on each sides. The cauliflower should be half cooked by now. Take out, drain and keep aside. In the same oil fry the potatoes till golden and keep aside. Pour the rest of the oil in the same pan. Crush the whole garam masala lightly to release the flavors and add to the oil when hot. When it sizzles add the cumin seeds and slit green chilies. Take care, as it will splutter a lot. Add in the chopped onion and fry on medium till its translucent. Pour in the spice mixture. Sprinkle little salt and fry till oil start to separate at the sides. Mix in the chopped tomatoes and keep cooking on low till the tomatoes are mushy and blends well with the spice. Now mix in all the fried potatoes, peas and cauliflowers. Give it a good stir. Cook for a couple of minutes and then add 2 cups of warm water. Mix, check the seasoning and cover. Let it cook on low flame till they are soft and cooked through. The vegetables should not be mushy but cooked and hold their shape. If needed add more water to cook it. Cook uncovered for a minute or so to adjust the gravy as per your liking. We like ours with little bit thin gravy so I added more water. Check the seasoning and finish off with fresh coriander or garam masala powder. You can omit onion if you like. Non vegetarians can also add lightly fried prawns along with the vegetables. Sending this to back to roots at a mad scientist's kitchen. 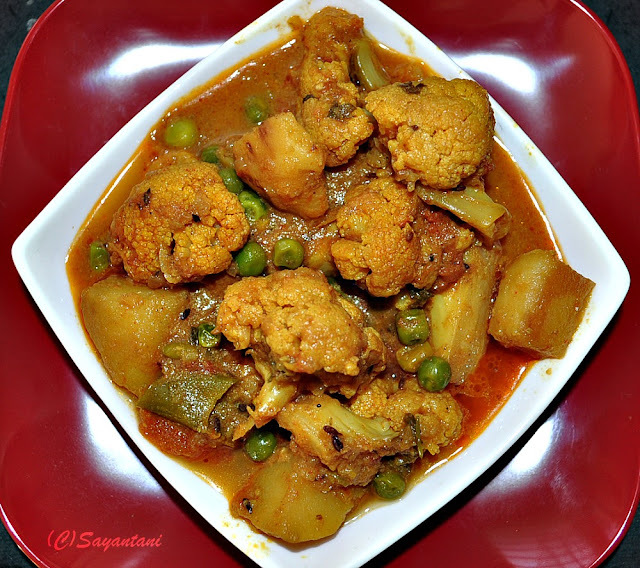 fulkopi, phulkopi, phool kopi, fulgobi, fulgobhi, kopir tarkari, bengali alu gobi, how to cook alu gobi, kopir dalna, kopi'r dalna, kofi, cauliflower, bengali style cauliflower gravy, cauliflower and potatoes in light gravy, curried cauliflower, peas, green peas, matar, mator, matorshunti, karaishuti, karaishuti die kopir tarkari, vegan preparation of cauliflower, side dish for rotis, dinner recipe, vegetarian side dish, sides with bread, Indian cauliflower curry, spicy curry with potato and pea, north indian spicy curry, how to cook cauliflower, tomato based gravy, cauliflower in tomato gravy, light soupy gravy dish, best ever cauliflower recipe. Looks delicious ...love the color ..yum! 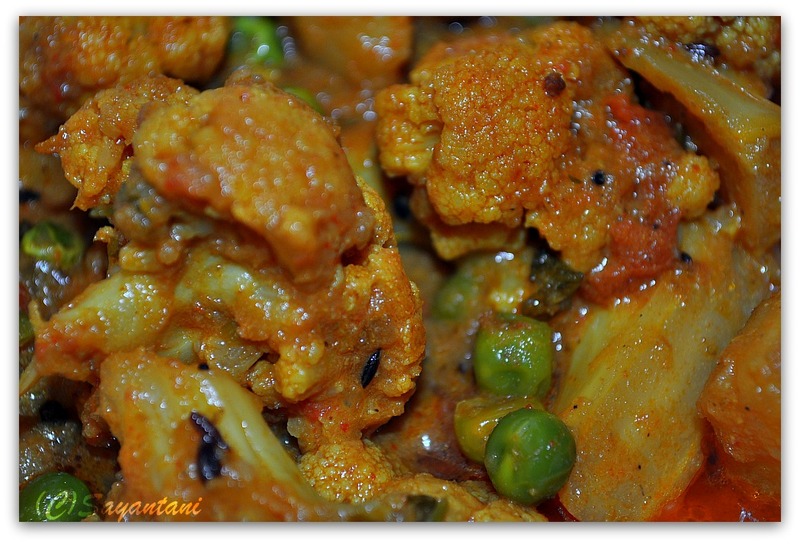 Allo gobhi with home grown gobhi... to good! Nice gravy. Looks yumm. Home grown gobhi..wow! I wasn't aware of this ritual (thanksgiving) until few years ago. This dish may look simple but the fact that it's home grown makes it special...I love it..
Yum yum, i can survive for many days with this incredible curry..
Lovely recipe...its been long since I stopped..so glad to catch up again..
Yummy cauliflower curry,homegrown makes it even more tastier. 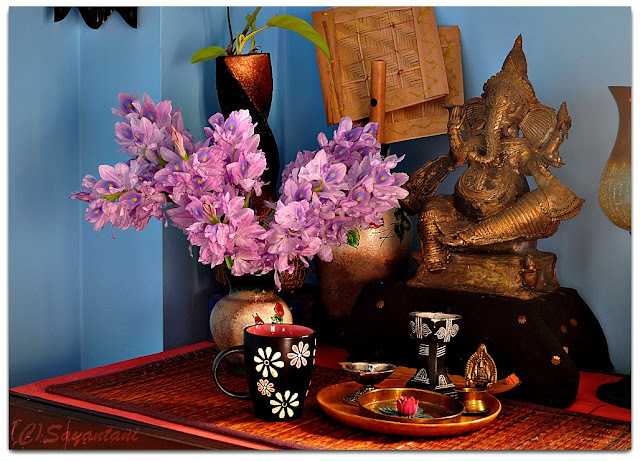 Lovely read and those flowers are so pretty..wish you had shared a snap of those blossoms too..:)..needlessly to say your curry looks very inviting..I might invite myself ok..! Looks homely and delicious. Cauliflower is a tricky subji. It needs deft handling, not to be overcooked and over spiced. your recipe appears dishy. Yes Sayantani, there is a lot of things to be thankful for. This cauliflower and potato dish is looking so very delicious. first time here.. had a fabulous time going through your blog... amazing recipes and pics... glad to follow you... do visit my blog sometime..
Yummy curry. Will make it with market brought cauliflower though. hanks again everybody...its a pleasure be n the blogosphere and a support system like you all. Thanks a bunch friends. @GB yes they are water hyacinth blooms aren't they lovely? very delicate though as it only lasted for a day at home. fouOne of my favourite dish.Looks delicious, yummy and mouth watering. How are you doing? 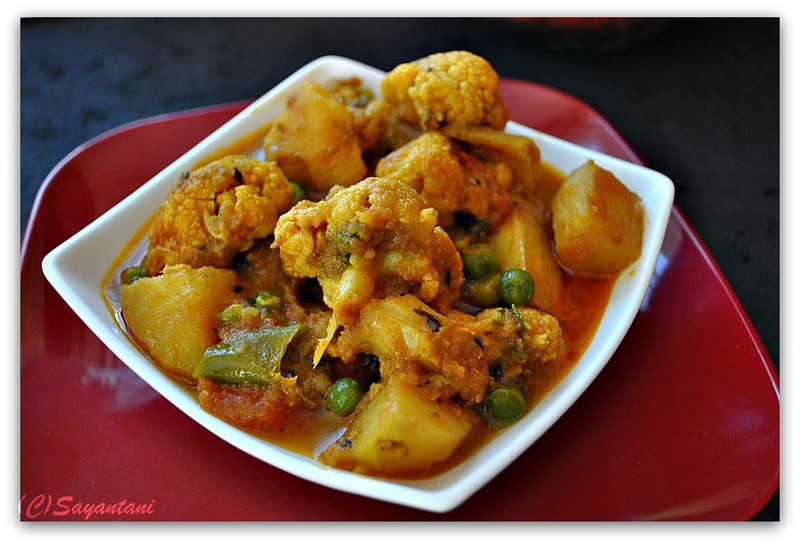 I love this dalna and have made it several times for S who simply loves Bengali food. Very nicely explained. Luvly collection of flowers in ur blog...Nic pics..
Love the lil birdie(first thing), art work at home is cute!! Have you changed your profile pic? The lil cub is with computer now a days? lovely read and nice recipe. Feeling homely just looking at them. Beautiful post! As I get older, I too realize how lucky I am. Looks delicious - I love the combination. Thanks for the recipe. I don't like boiling cauliflower,which will destroy the fullkopi flavor. If any bugs stuck inside will die while cooking and may be a good source for protein. I have made this twice and will again this weekend. My husband LOVES it. He declared it the best cauliflower dish he has ever had! So this recipe gets two thumbs up from me.